Do you enjoy weekend getaway to country leaving the hustle and bustle city life behind, and soak up with fresh country air? There is something about country that takes a special part in my heart. I was not raised in the farm but just thinking of country life makes me feel like I’m home. 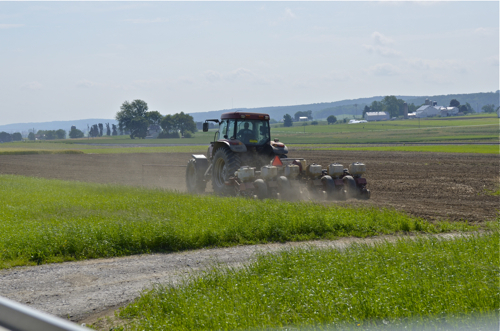 Last weekend I took my family to Lancaster county, Pennsylvania. 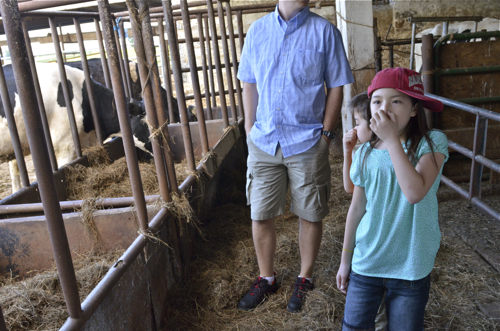 We stayed in a small working farm house with lots of farm animals. 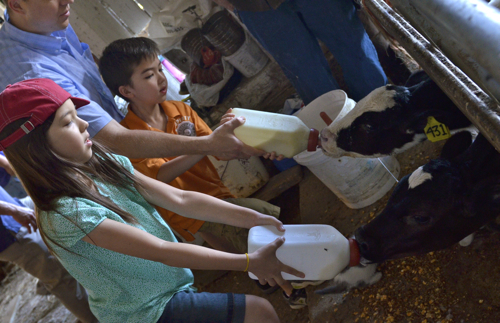 We learned to feed the calves and milk the cow. My kids had a blast by playing with kittens, ducks, bunnies, chickens, goats, etc. We ate about 10 different pies in 24 hours time. Yes, 10 pies! All made from scratch… We even had rhubarb pie for breakfast. Out of all the farm experience we had there, my most cherished moment would be getting to know the Amish community in Lancaster county. I have known little about their belief and the life style. It was such a wonderful experience to get to know better of them. 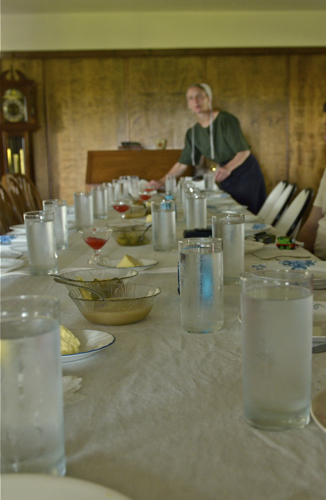 We had a dinner with an Amish family one evening. A woman named Ruth, mother of 11 children and widowed, prepared such an amazing meal for us. All from her garden, the meal was simple and humble but it was the best home cooked meal I ever had. She shared her life story and her faith in God with us. She was willing to answer to all of our questions patiently. “My husband died when my youngest was 6 weeks old but God took over to take care of us, and we helped each other.” Her faith in God and the strength touched my spirit and I felt embarrassed how spoiled I am to complain the hardship of raising just 2 kids. She had many trials in life just like us, but her attitude toward the challenges may not be the same as ours. Her example was the strength of woman and of motherhood. Her children are so well mannered and diligent. They are the fruits of her example. 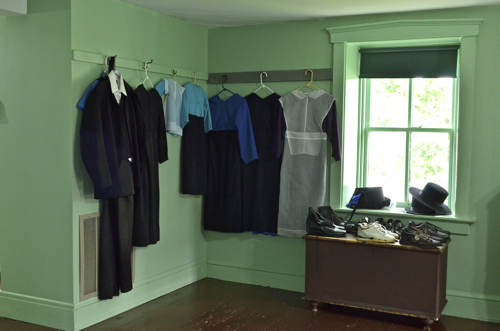 Amish people are obedient to their religion down to the core. They have many restrictions on modern technologies. 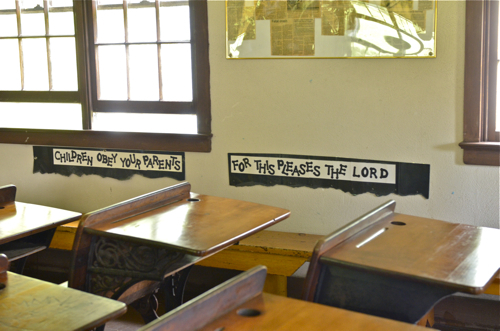 But as Ruth said, “We don’t know all the answers but we obey”. 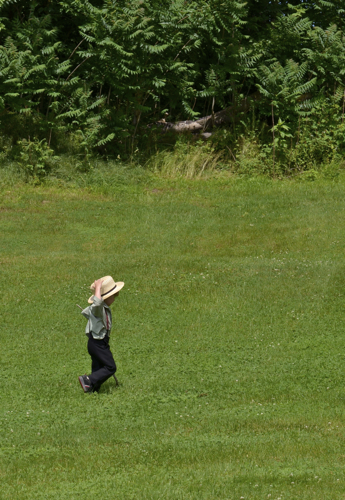 Amish people are kind and hard working people who chose to live in different way of life. It was great learning experience for us to observe the principle of obedience and self-reliance from them. Below are some highlights of this trip. Learning to feed the calves in the crack of dawn. 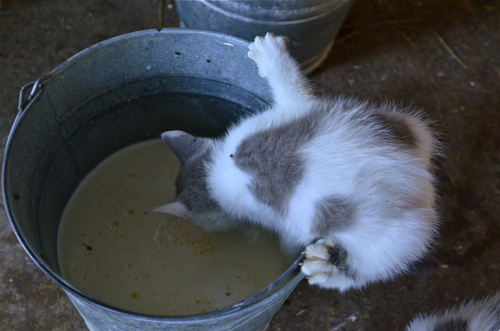 This kitten was desperate to drink some of the formula prepared for the calves. 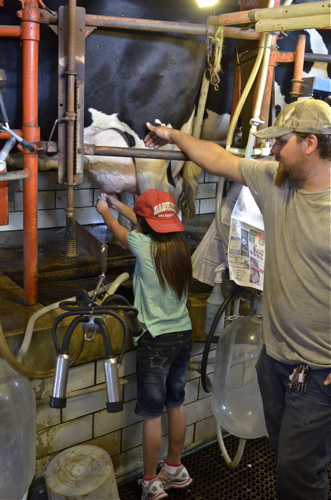 Learning to milk the cow by hand from the local farmer. 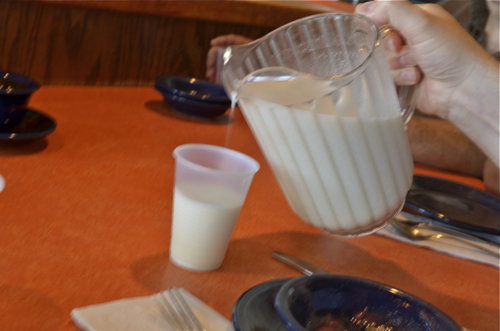 Fresh raw milk (w/o pasteurization) for breakfast. Their milk was licensed to drink as raw. 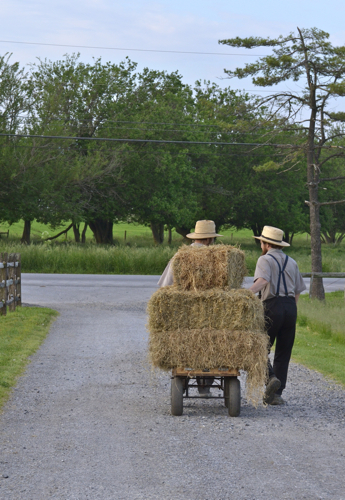 Amish men delivering some hay. They looked like teenagers but had beard, which means they are married. 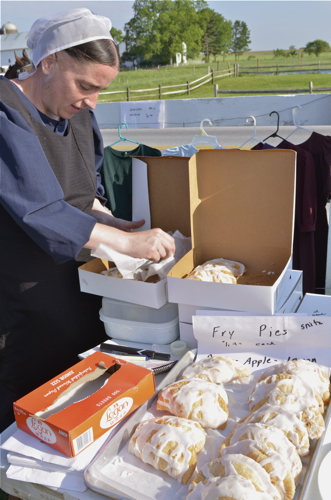 Amish fry pie, deep fried pie with icing on top. 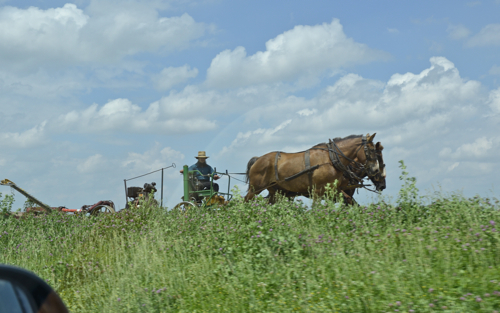 An Amish farmer working with his horses on the farm. The modern farmers using a tractor on the other side. They don’t use electricity but use portable gas to run the refrigerator or lamp, etc. They used to prohibit any buttons since they were believed as embellishment. Women attached their apron on the dress with pins only. This is what I am talking about, kiddos! 4 year old boy named, David, running in the village. He told me that he loves to catch frogs and snakes. I shared a piece of licorice with him and he gave me a big smile. 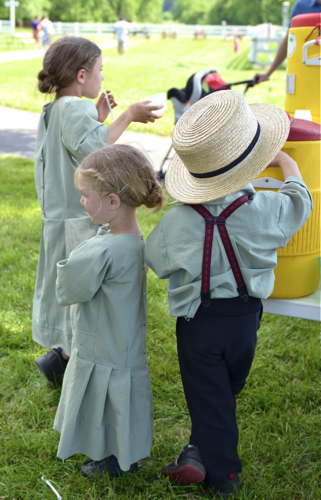 Amish kids are so beautiful. It must be the pure Germanic gene. 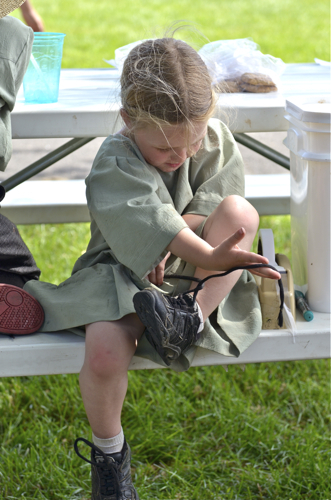 Tying shoes is difficult to any young children no matter who they are. He is 12 years old and made a tree house in his yard with his 10 yr old brother. How many 12 yr old do you know that can build a tree house from scratch? 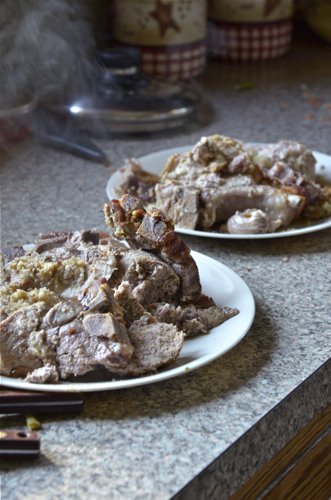 One of the main dish we had, Pork loin with stuffing. Really good! 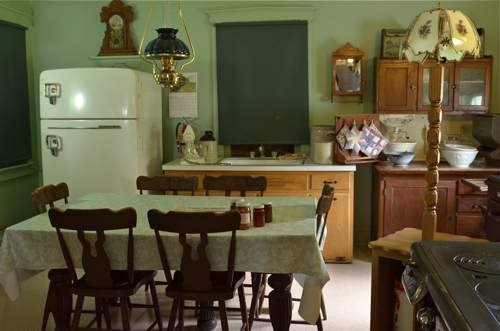 Ruth served fried chicken, pork loin, mashed potatoes, green beans, asparagus, garden salad, buttered noodles, rolls, homemade butter and jam, and banana bread. 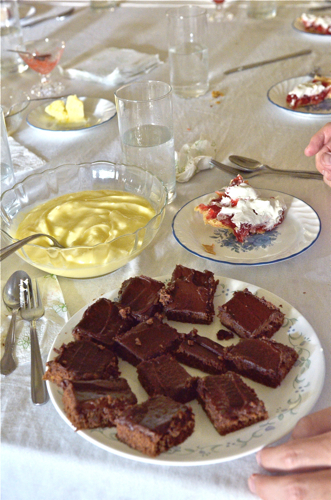 For dessert, she served strawberry pie, apple pie, brownies, and pudding. All made from her garden, she must have spent the entire afternoon to prepare for that meal. She picked the strawberries from her garden moments before she made into pie that day. Very soft and cakey with divine frosting, almost like a sheet cake. Ruth was gracious enough to share the recipe with me. I will post that someday. 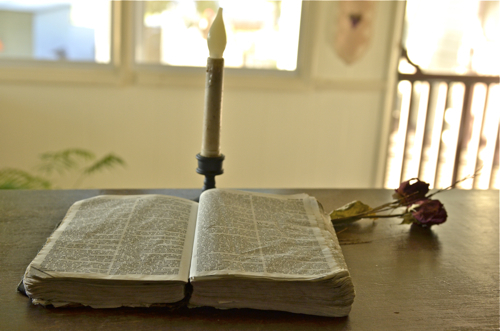 The bible was located near the entrance of the front door. You can tell their love of scripture. 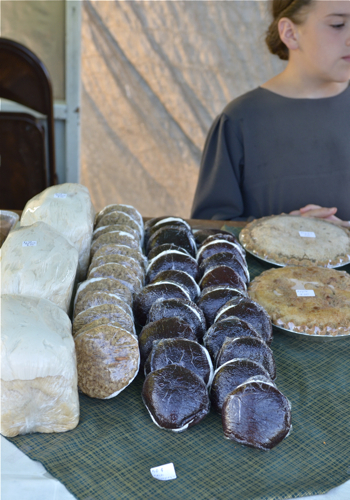 An Amish girl was selling baked goodies on the country side road. We bought some of her whoopie pies and they were soooo good. 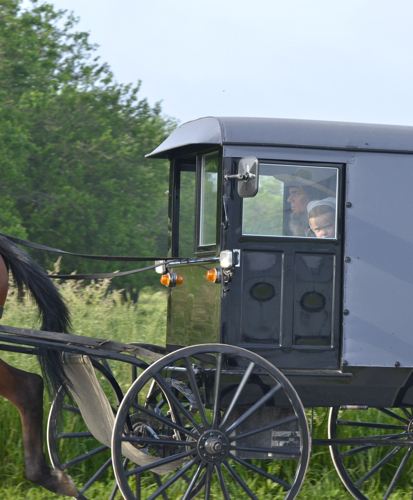 Amish buggies were everywhere. They go quite fast. I can still hear the echo of the buggy horse galloping on the road. 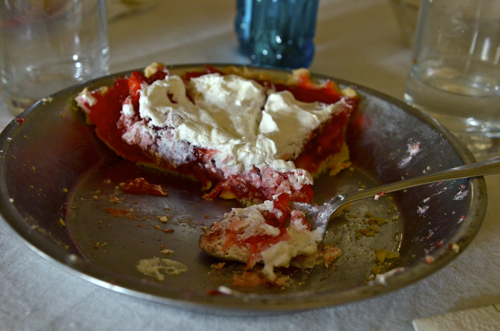 So, I made strawberry pie to recollect my memory of this trip. My strawberries were from Costco, not from the garden, but it was delicious. The recipe came from the “Cook’s Country”. I have had my eyes on this recipe for a while to try out since I saw that episode in PBS. Unlike Ruth’s pie, which she used strawberry jello for the filling, this recipe uses frozen strawberries with unflavored gelatin to set. I have to admit that I should have let it chill overnight to set completely before I cut it. My patience was running out so I cut after only 1 1/2 hours. Of course they were not fully set, but tasted excellent. 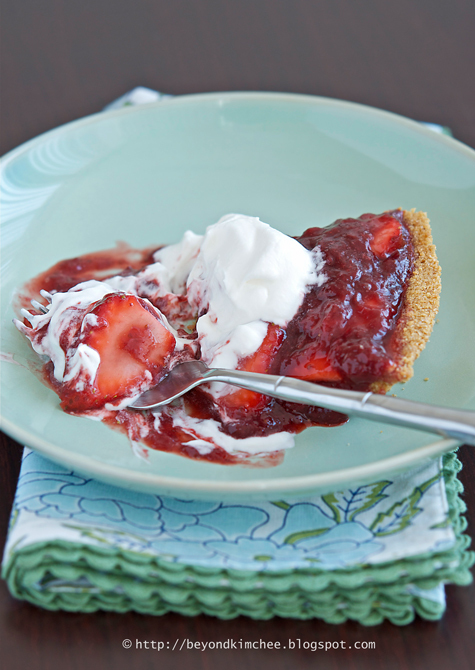 The only change I made with this recipe is that I used graham cracker crust instead of pie crust. Ahhh…, the weather is getting warm. 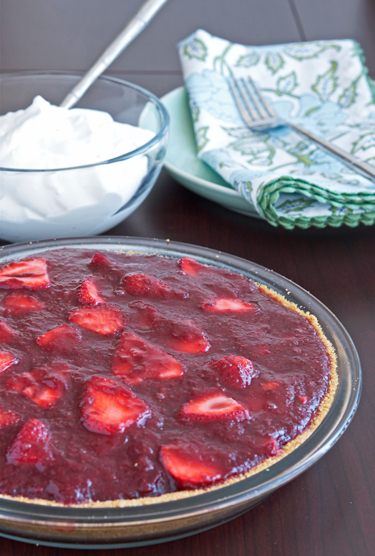 Celebrate your summer with fresh strawberries and delicious cream on top. And let’s be grateful for the beauties of nature and be respectful of every life in it. « Pan Fried Rice Cakes, do you dare a devil? Such an interesting trip! 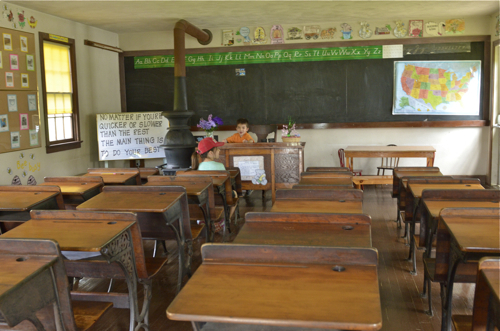 I enjoyed getting to know the farm and the Amish life through this post. those are some lovely photos! 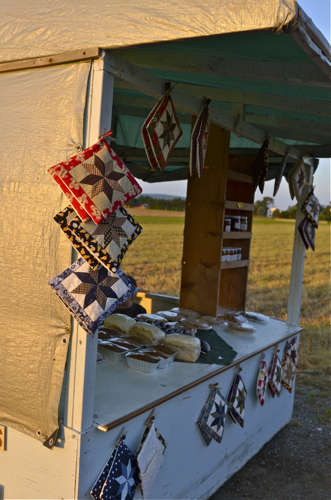 I love raw milk and it's a great treat to see those farmers actually at work, and I love how their lives are so simple and centred aroudn communty and food. AND love those strawberries. strawberries and cream, classic yumminess! For a change, try them with balsamic syrup, also delicious! Hi, loved your post. Can you please tell me where u stayed? I am looking to do this with my kids... thank you!!! Hi! 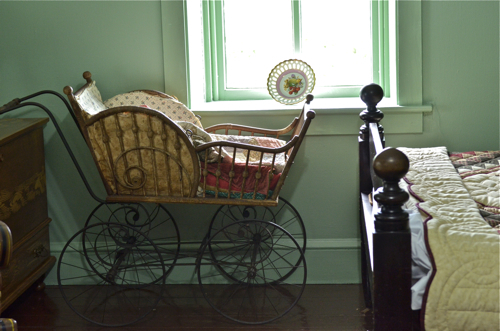 I stayed at the farmhouse style B&B; called Verdant view farm at Strasburg, PA. Remember it is country farmhouse, not Hilton or Marriott. You will see what I mean when you go to bed at night. :) But you will enjoy their breakfast. very interesting post. I´d like to take my daughter to the farm. Surely, she will have a blast with all those farm animals. I live in New Jersey. How far is it to get there ?? I am not sure how far it is from NJ but it took about 3 hours from D.C by car (w/ traffic). The town is called Strasburg, PA.
Have a similar trip planned for this summer and I'm thinking of having dinner with an Amish family. Was it just your family who had dinner, or were there other guests. Did the kids enjoy it? There were some other people joining the dinner as well. I have to tell you that the Amish lady didn't ask for specific cost for her dinner but did ask for contribution to cover the cost of her food. You will be surprised how some people can be ungrateful and even rude. When I got the contribution jar (our family was the last one to take the jar), I only saw only a few dollars in it and even some coins. Apparently some of these families acted quite cheap with their charitable heart. They were the ones showed up with their Mercedes and BMW. My husband and I were quite upset and embarrassed. We added more than what we originally decided to contribute. We just didn't want her to be disappointed and have unpleasant feeling about her service. My kids enjoyed a lot and it was great learning experience about self-reliance, and hard work for them. Hope you enjoy your time with them. The food was really delicious and fresh. Hello! I live in Lancaster country (AKA Land of the Amish) , i love everything here, except the smell :) but after living here for all my life i got used to it. I'm glad you had a fun time. Is there a way you can provide more details on the farm you stayed? Would they accept guests? we are a family of 4 and would like to try this experience.. Appreciate your reply!